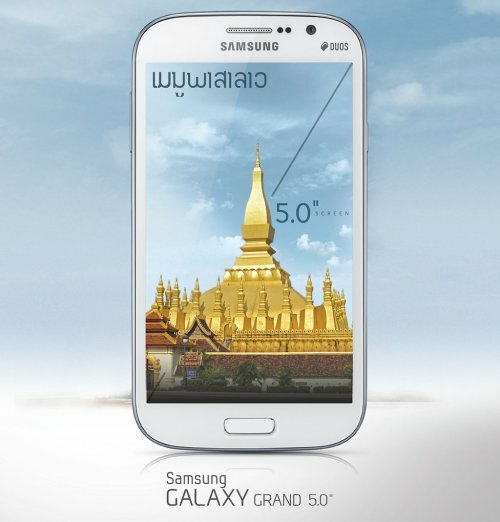 In response to demand by users, Samsung has released the first Smartphone with native Lao Language, the Samsung GALAXY Grand. Menus are in Lao, users can type in Lao and can read the web browser in Lao. Customers who have purchased pre-Lao language products can upgrade their Galaxy Grand with Lao firmware available on the internet. All future Samsung smartphone models are now to include Lao language, as well as other regional languages including Malay, Thai, Tagalog and Burmese. The Galaxy Grand comes with a 5 inch touch-screen, Android operating system 4.1.2, dual-core 1.2 GHz, an 8-GB built-in memory card and SD slot for increased memory capacity up to 64 GB, an 8-M-built-in camera and numerous other features. ??????????? Smart Phone ????????? ???????????? ??????????????????????????????????????????????????????????? Samsung ???????? ?????????????? ???????????? Samsung GALAXY Grand ??????????????????????? Smart Phone ??????????? ????????????????? ??????????? ???????????? ????????????????? ???????????????????? ??? ????????????????????????????????????????. ??????????????? ???????????????????????????????????????????? ?????????????????????????????????? ????????????? Samsung ??????????????????????????????????????????????????????????????????????????????????????????????????? ?????????????????? Smart Phone ??????????????????????????? Samsung ??????????????????????????????????? ??????????????????????????????????????????????????????????????????????????? ??? ???????????????????????????????????????????? ??????????????????????????? Samsung ?????????????????????? ??? ????????????????????????????. ???????? ??????????? Samsung ??????????????????????????? Smart Phone ?????????????????????????????????????????????????????????? ???????????????????????????????????????? ???? ?? ?.